Elvira was born at Hardin County, Kentucky, on 7 February 1820.1 She married Thomas Davis Tabb at Hardin County, Kentucky, on 12 November 1838. Elvira died on 17 March 1888 at Hardin County, Kentucky, at age 68. Her body was interred after 17 March 1888 at Hardin County, Kentucky, at Valley Crreek Baptist Church Cemetery. Susan was born on 8 July 1831. She married Robert Chambers Tabb at Hardin County, Kentucky, on 12 March 1853. Her body was interred in November 1916 at White Mills, Hardin County, Kentucky. Susan died on 18 November 1916 at Hardin County, Kentucky, at age 85. Evaline was born on 23 January 1833. 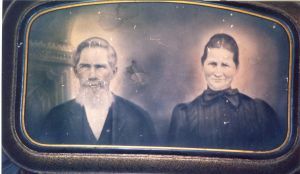 She married John Buckner Tabb at Hardin County, Kentucky, on 13 December 1855.1 Evaline died on 4 July 1907 at Hardin County, Kentucky, at age 74. Her body was interred after 4 July 1907 at Hardin County, Kentucky, at Valley Crreek Baptist Church Cemetery. [S55] According to his tombstone. [S56] According to death certificate. [S57] He died of chyolera while at college and left no issue. John was born at Nelson County, Kentucky, on 30 October 1823. He married Mary Chisman Tabb on 3 September 1851. His body was interred in 1903 at White Mills, Hardin County, Kentucky, at Union Church Cemetery. John died in 1903 at White Mills, Hardin County, Kentucky. [S58] According to Death Certificate. [S59] According to death certificate. Henry was born on 6 December 1826. He married Nancy Davis Tabb on 20 May 1870. Henry died on 19 April 1889 at age 62. Martha was born at Hardin County, Kentucky, on 12 January 1826.1 She married Samuel William Chenowith Thorton Wortham at Hardin County, Kentucky, on 2 December 1855.2 Martha died on 4 April 1907 at Glendale, Hardin County, Kentucky, at age 81.1 Her body was interred in April 1907 at White Mills, Hardin County, Kentucky, at Union Church Cemetery. [S262] Hardin County Marriage Register C #867. Samuel was born at Nelson County, Kentucky, on 3 October 1834. He married Martha Blue (Patsy) Tabb at Hardin County, Kentucky, on 2 December 1855.2 His body was interred in April 1919 at White Mills, Hardin County, Kentucky, at Union Church Cemetery. Samuel died on 24 April 1919 at White Mills, Hardin County, Kentucky, at age 84. [S911] Source: Amy Babinchak (e-mail address) in a e-mail dated 11 March 2002. She said "My aunts an mother have been to the Tabb family reunions in the past. One of the corrections that they were able to make is the name of Samuel William Chenowith Thorton Wortham. This was verified at the Tabb family reunion by a living member of the family - Lula. Conway was not in his name. My mother's aunt lived with them." [S392] Source: Kentucky ancestor Charts From ancestral Trails Historical Society by Judy Nacke. Chard by Robert E. Goodman, 1344 Earl Avenue, Louisville, KY 40215, #206. [S60] According to the Index to Kentucky Deaths. Daniel died. Daniel was born. He married Malvina McNeil Tabb on 29 October 1855. John died. John was born. He married Lucretia Tabb on 28 April 1877. Elizabeth was born in 1852. She married George Washington Tabb on 5 February 1880. Her body was interred in 1934 at Hardin County, Kentucky, at Elizabethtown City Cemetery.1 Elizabeth died in 1934. [S61] Section M, Lot 394. James was born at Kentucky in 1837. He married Elenor Morgan Tabb on 20 March 1860. James died in 1912 at Kansas. His body was interred at Hardin County, Kentucky, at Valley Crreek Baptist Church Cemetery. Isaac was born at Hardin County, Kentucky, on 2 January 1840. He married Amanda Jane Hocker at Kentucky on 4 February 1861. Isaac died on 29 December 1921 at Attica, Indiana, at age 81.